Bolt Motorcycle hardware meets or exceeds STOCK specs. This kits is a common size on most bikes but it remains the responsibility of the buyer to check the appropriate size fitting before order. 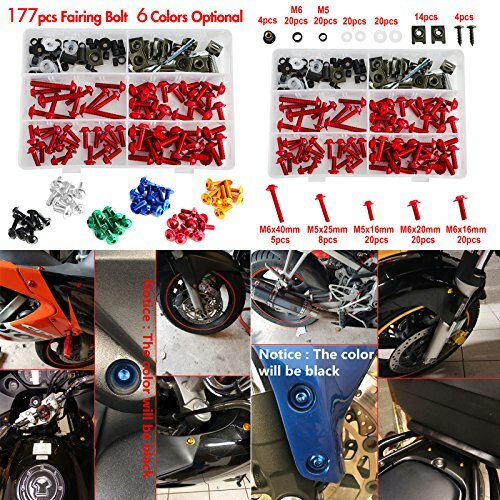 Motorcycle Aftermarket replacement Parts,100% branded new. This is a replacement spire/speed clip and bolt kit,as used to secure fairings,bodywork,bumpers or just about any panel to another. Bolts have been made from high quality aluminium that resists corrosion,is very strong and has a shine that will last. Please Note:The Surface Finish is Anodized Aluminum and Hardness less than 304 steel. If you have any questions about this product by NICECNC, contact us by completing and submitting the form below. If you are looking for a specif part number, please include it with your message.